Do you want to learn more about how people use your website? Wondering how the Behavior reports in Google Analytics can help? To explore how to navigate the Behavior section of Google Analytics, I interview Andy Crestodina. 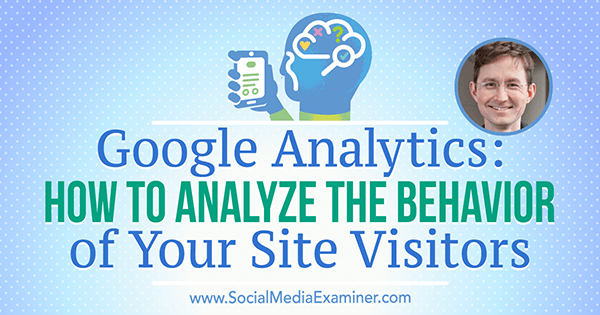 Andy explains how to analyze the behavior of your website visitors. You’ll discover a few Google Analytics tricks to employ immediately. 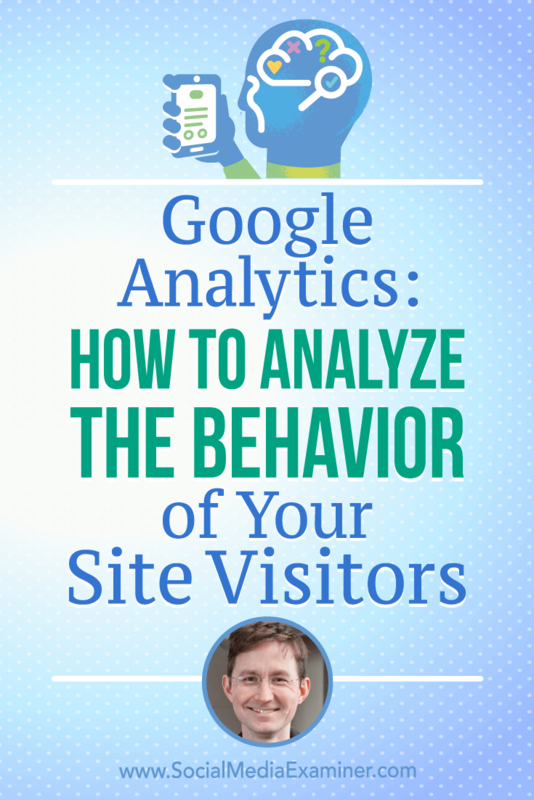 Google Analytics: How to Analyze the Behavior of Your Site Visitors featuring insights from Andy Crestodina on the Social Media Marketing Podcast. The five basic Google Analytics reports. In Google Analytics, the Behavior category is one of five main categories that you find on the left-hand sidebar. Andy says the categories are organized from the top of the funnel down to the bottom. The first category is Real-Time, or people on your website at the moment. Real-Time is followed by Audience (who those people are), Acquisition (where they came from), Behavior (what they did), and Conversions (who took which successful profitable action). People dedicate a lot of time to the Behavior category because the reports show what’s happening on each URL and how people flow through your website. Andy says you can see where people go, how much time they spend on pages, bounce rate, percentage of people who leave after seeing just one page, number of pages per visit, and so on. The Behavior category is the core of Google Analytics reporting. What you find through Behavior reports is often surprising, Andy continues. Although a website is designed to encourage visitors to navigate through it in certain ways, the Behavior reports show how visitors actually move through your site. Listen to the show to hear an explanation of the value of behavior analytics with a restaurant analogy. Andy believes Behavior Flow is an interesting and sometimes confusing report because it mashes up data from other reports. The Behavior Flow report looks almost like an infographic. It shows how many people are on your website, where they move as they navigate from page to page, and the page where they leave your site. After the starting page, the next column is first interaction, the column after that is second interaction, and so on. Behavior Flow shows the most popular path through your website, which is important. Knowing the most common path helps you prioritize changes to your website. For example, if you have only 10 minutes to work on your website this week, you need to spend that time on the pages people visit most often. Even if your website has thousands of pages, a small percentage of those pages receive the most traction and traffic. Therefore, when you have a great piece of content such as a beautiful testimonial or a compelling visual, you want to put it where people are more likely to see it. If your website was a city with a highway flowing through it, you’d put your billboards on the highways, not on little backstreets. In the Behavior Flow report, the first column is the Landing Page option, which reflects where your website traffic comes from. You can change the default Landing Page option to see the website traffic from a specific source. For example, you can select social options to see how people coming from different social networks move through your site. Change the default Landing Page option to see the website traffic from a specific source. Next, you see the Starting Pages column. Andy says this column lists only the top pages. (For analysis of a specific page, you need to look at the Site Content reports.) Each page (URL) is a green box. Next to the green box is a red line with a downward-pointing arrow. The red line shows how many people left from the page. Hover over the red line to see the number. If people continue to another page, a little gray line connects the starting page to the next visited page. With these gray lines, you can see at a glance the highway going through your city of a website. When you click a green box, you can select an option that highlights the traffic through that web page. For example, Andy can see that people who visit his article Website Best Practices tend to go back to the blog’s main page. From there, a percentage goes to the website’s homepage. Use the Behavior Flow report to see where users go after visiting a specific article on your website. Andy says you don’t need to spend a lot of time analyzing behavior flow. With this report, your goal is to develop a good sense of the major paths through your website. 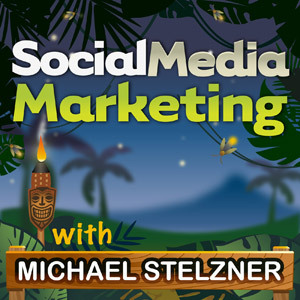 Listen to the show to discover what I learned about a specific Social Media Examiner article by analyzing the flow. Andy says the All Pages report is one of the most important reports in Google Analytics. To see this report, select the Behavior category and then Site Content. You’ll find the All Pages report under Site Content. The All Pages report lists every URL on your website, so this report enables you to see the behavior flow for any page. Scroll through the list to find a post or use the search feature. By default, you see 10 pages at a time, but you can choose to view more per page. Andy is looking at a blog post called Ways to Improve Your Website. The Navigation Summary shows you the web page that led visitors to your selected page and the page people visited next. Andy says the Navigation Summary is powerful because you see the page on your website that led visitors to your selected page and the web page on your site that people visited next. After you view the Navigation Summary for a page, Andy says you can analyze how that page is working. Start with your home page to see which items in the main navigation are clicked most and least, and develop ideas about how to optimize your visitors’ experience. Andy says you need to be able to look at something and say, “This is working. Can I make it work even better?” or “This isn’t working. Can I either improve it or just remove it?” For instance, say you have a giant orange call to action on your site and no one is clicking it. You’d likely determine that something about the call to action needs to change. You could add white space around it, change the button text to indicate a benefit, or try a different call to action. Andy says you should also consider removing items that people don’t click because removing an item makes everything that’s left more visually prominent. If you have something that’s visually loud and you can tell from the Navigation Summary that no one is clicking it, consider taking it off the page. You just cleaned up the site and made everything that remains easier for visitors to find. This data also gives you clues into what information people need in what order. For instance, Andy says you might look at Back button behavior. People who come to a page and then go back to the one before likely didn’t find the answers to all of their questions. Use these insights to change the labels in your navigation, add or remove elements, change calls to action, front-load content earlier in a sales process, and more. You want to do a better job of guiding visitors through your website. Andy also talks about the Exit Page reports, which are especially relevant to social media marketers because they often send traffic elsewhere (to a social network) for engagement. Social media marketers also blog and naturally link to other websites, resources, content, friends, partners, and allies. From this report, you can see the exit pages from most to least popular. When you look at Exit Page reports for insights, Andy says to consider three questions: What’s the intent of visitors who come to the page, did they meet their goals, and is your site or company extracting some benefit from the visitors while they’re on the page? For a social media marketer, a blog post that’s a popular exit page still fulfills its purpose of helping visitors achieve their goals. Andy says if these visitors move on, the visit is still successful. Tool roundups are another type of post where no one is going to stick around. However, Andy says you can use Exit Page reports to see where you’re encouraging people to leave and make sure you’re doing so deliberately. For pages intended to generate leads or sales, Andy says that exits might indicate something more problematic. When I ask if it’s a problem that my homepage is one of my top three exit pages, Andy says no. The homepage is a top exit page because Social Media Examiner is like a magazine. People can come to the site, scan the headlines, have a short visit, and go. The Exit Page report shows you where people leave your site. Listen to the show to hear what I discovered about the people who read our How to Use Instagram Live article using the Navigation Summary tab. Event tracking enables you to see not only the page where people leave your site, but also where they go. Andy explains that Google Tag Manager enables you to track this information, which normally isn’t available in Google Analytics. Event tracking can also show you when someone takes an action that doesn’t take him or her to another page. For example, you can track when someone clicks a PDF or watches a YouTube video that’s embedded in your page. Andy calls event tracking the “duct tape” that catches all of the interactions that aren’t page views. Andy says tracking where your readers go when they leave can help you make better decisions about your content. For example, you might inadvertently entice your visitors to take some action that isn’t what you want them to do. With event tracking, you can see when that’s happening and decide how to change your web page. Listen to the show to hear Andy share more examples of how to take action based on event tracking data. I ask Andy what additional tips he can share about visitors’ behavior on a website. Andy says that anyone who has a search tool should look at the phrases people enter when they search your website. To see what people are searching, click the Behavior category and then expand the Site Search option to find a report called Search Terms. Andy says the Search Terms report can reveal all sorts of gold. You may realize people are looking for topics you don’t have, topics you thought were easy to find, or topics that are popular and deserve more attention in your content strategy. After you see the Search Terms report, Andy recommends you search for everything people are searching for on your site. You want to see what visitors are seeing. You also want to know if your search box is a crutch for bad navigation. Andy believes that at the very least, the Search Terms report is a listening tool. I ask Andy to discuss a trick for adding dimension to your reports. Andy says you find this tool in the Behavior category by clicking Site Content and then All Pages. On the Explorer tab, you start with a list of page URLs. Andy says you can use the dimension tools for this list to answer all sorts of questions about your website. 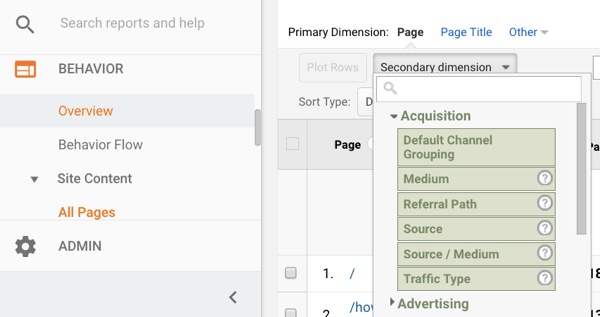 Use the Google Analytics secondary dimension drop-down menu to dive deeper into audience behavior. For example, say your question is, “Which pages are the most popular among people coming from social media?” By adding a secondary dimension, you can show the acquisition medium for each page. (Andy says a secondary dimension simply inserts a column of information from another report.) To add this column, click the Secondary Dimension drop-down list above the list of pages and then select the information you want to see. At this point, you might see all of the acquisition sources, including organic and social. By using a filter, you can limit the information in the second column to just social. Andy explains that the search box will filter only the first column (the primary dimension). To filter the second column, you need to click Advanced and set up an advanced filter, such as “include medium containing social.” After you click Apply, you’ll see the most popular pages as viewed by people who came from social media. Just click around, Andy suggests. You can add anything as a secondary dimension and then use the advanced filter. Creating a custom report takes a total of maybe five clicks. To save a custom report, click the Shortcut button in the upper-left corner of the page. (If you click Add to Dashboard, Andy says your report appears on a screen with lots of different reports and they will all be small.) After you click Shortcut, give the report a name (for example, Top Pages for Social) and click OK. You can find your Shortcut under Customization. Listen to the show to learn about using date ranges to create and compare reports and why this technique is so powerful. Ask Alexa a question and it gives you a response type. For example, connect Alexa to your home to turn on the lights, ask Alexa for weather and traffic reports, and so on. Reverb also enables you to be less tethered to Amazon devices for Alexa, such as the Echo or the Echo Dot. For instance, if you have a Dot in your office but you’re on the go, you can pull out your phone, open Reverb, and ask Alexa anything. Reverb has all of the benefits of the service without the hardware. Reverb is on desktop for Mac and on mobile and tablets for iOS and Android. Listen to the show to learn more and let us know how Reverb works for you. Learn more about Andy on his website. Check out the Orbit Media blog. Check out Andy’s posts, Website Best Practices and Ways to Improve Your Website. Read Andy’s article Google Tag Manager in 10 Steps. What do you think? 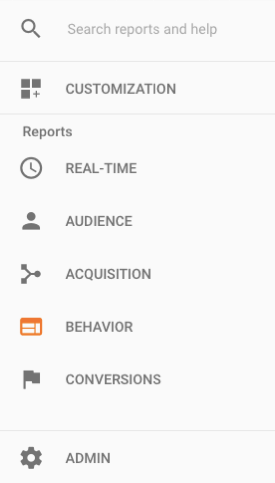 What are your thoughts on Google Analytics Behavior reports? Please leave your comments below.